Project: Chronic illness — eclipse experience Ltd.
How might we create a system of self-management for people with chronic diseases and their healthcare practitioners? This 2 year project for a major pharmaceutical company set out to create a digital support and self-management service for those living with chronic conditions that require constant attention. In addition to prototyping the digital service, Eclipse set out to understand it's use over time within naturally occurring care groups. The project utilised a design-led research approach with the team initially designing a service blueprint of the proposed experience to take into the research. Later, they built and tested a digital prototype in context with chronic disease afflicted groups as well as healthcare practitioners. Eclipse delivered personas, user journeys, insight and a research report along with an insight film and a project website for socialising the outcomes inside the client organisation. The self-management system is currently being advanced by our pharmaceutical company client through a clinical trial. Eclipse has codified this experience in a paper which was shared more widely via EPIC and through event talks in London and the US. Living with a chronic disease involves daily routines of self-management that are kept throughout a lifetime. Taking medication, regular exercise, and understanding healthy behaviours are just a few elements that are crucial to keep on track of these conditions, but often very challenging to access or maintain. In this project, we worked with people with a chronic disease of the lungs along with their healthcare practitioners (HCPs). Although initially we were asked to develop the out-of-the-box experience for people first introduced to a self-management service, we quickly realised that there was a need to examine the proposition for the service and develop the experience that it would deliver as a whole. We developed a prototype service proposition and brought it to people with a chronic disease in their homes, inviting them to open the packaging and begin with the initial set-up. Through these interviews and by observing, we determined how to adapt the proposition so that it would resonate with them, and how to shape this initial packaging experience to make it accessible and encourage first use. For the next phase of the project, we developed a live digital prototype of the full self-management service. 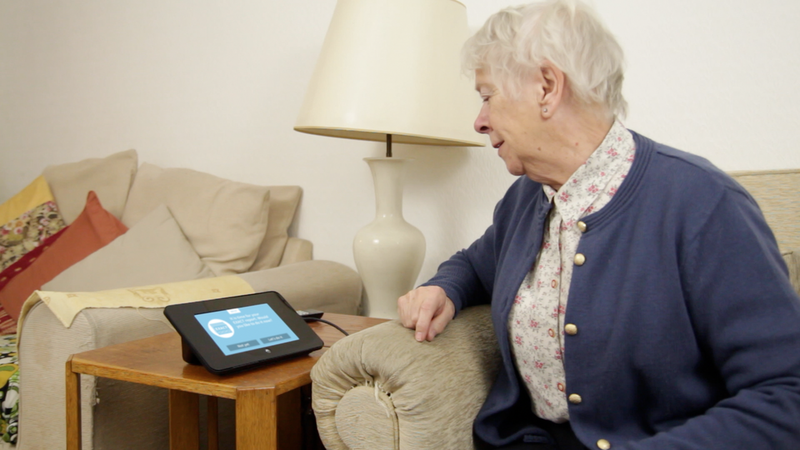 It included a number of self-management programmes, with an interface designed for people with the condition, and a separate interface created specifically for their clinicians and carers. In both Germany and the UK we recruited people with the condition along with their HCP team and we introduced them to the service which they used over a three-month period. During this time, we visited people in their homes and spoke to them about their experience using the service in their natural environment. When their loved ones - husbands, wives, children - were there we brought them into the conversation to explore their roles and experiences. We asked people to show us how they used the system, and brought in paper prototypes to mark the changes that they spoke about. In parallel, we travelled to GP surgeries and hospital offices to talk to the HCPs involved in those persons' care. Again, through observation of their use of the service, paper prototypes, and semi-structured discussions, we developed an understanding of how the system worked in their daily lives, and how it could be adapted to become more valuable to them. Across this period we acted as technical support, so with ad hoc visits to fix bugs or replace wires, we built on our understanding of the use of the service over time. After each round of visits we shared our insights with the design and development team for the next phase of iterations, and system updates with our participants which we could then explore in the following interviews. The picture that we constructed was a rich one: how do people managed their condition over time? how could the service work within the context of their existing daily routines? how could it begin to shape the routines for positive behaviour change? and how could it interface with the HCPs to consolidate a network of care?